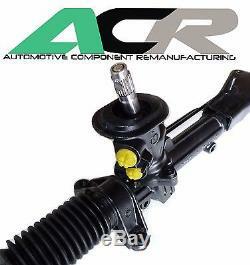 VW BORA 1998 to 2005 all models (excluding 4 wheel drive) Re-manufactured Power Steering Rack. Fitting available at our factory in Wakefield, West Yorkshire. Please give us a call for a quote. We have over 30 years of experience within the Remanufacturing sector of the Motor Industry and are able to offer for sale GENUINE Original Equipment reconditioned power steering components. Our aim is to provide our customers with a first class product backed up by a first class service. To achieve this we will guarantee to never supply any imported product as we believe this to be of poor quality and potentially costly to the customer. We will also never supply new imported replica units described as reconditioned. Using genuine OE parts, our units are tested using Hi-tech modern equipment, beyond any normal operating levels to ensure we are able to supply a high quality product to our customers. Mon - Fri 08.00 - 17.00. Sat 08.00 - 12.00. (Out of hours collections available by appointment). Collections available from our workshop at Wakefield, West Yorkshire, WF4 5NW. (Please Note some Northern Scotland deliveries can take up to 3 days). Orders placed on Friday before 12.00pm will be dispatched for arrival the following Monday (UK Mainland Only). ALL STEERING SYSTEMS MUST BE COMPLETELY DRAINED OF FLUID AND FLUSHED PRIOR TO FITMENT OF ANY PARTS. Any orders placed and paid for by 2.30pm Monday to Thursday will be dispatched for next day. Orders placed on Friday before 1.30pm will be dispatched for arrival the following Monday (UK Mainland Only). Our Garage - We have our own purpose built garage & a 10,000 Sq Ft Factory with onsite fitting available. Mon - Fri: 08.00 - 17.00. Sat: 08.00 - 12.00. You can send us a message by using the "Questions and answers" section towards the bottom of the page. The item "VW Bora 1998 to 2005 (excluding 4WD) Re-manufactured Power Steering Rack" is in sale since Thursday, February 9, 2017. This item is in the category "Vehicle Parts & Accessories\Car Parts\Suspension & Steering\Steering Racks & Boxes". The seller is "automotivecomponentremanufacturing" and is located in Wakefield, West Yorkshire. This item can be shipped to United Kingdom, Canada, Mexico.